The wild turkey (Meleagris gallopa) is native to North America and was a staple in the Native American diet. It was imported to Europe in the early part of the 16th century by the Spaniards via Turkey (the country.) It was confused in those early times with the Guinea fowl which also arrived via Turkey, and both birds were called turkeys in those days. When it was assigned its Latin name in the 18th century, the name turkey still stuck. Native Americans called it peru with no reference to the country of the same name. Turkey was introduced to the early Pilgrim settlers by the Native American Wampanoag tribe after the Pilgrims arrived in 1620. The first year for the settlers was bleak, with many dying from the journey. Their seeds, aside from barley, did not produce any usable crops. The Indians assisted the settlers, introducing them to native foods such as corn and squash and showed them how to hunt and fish. 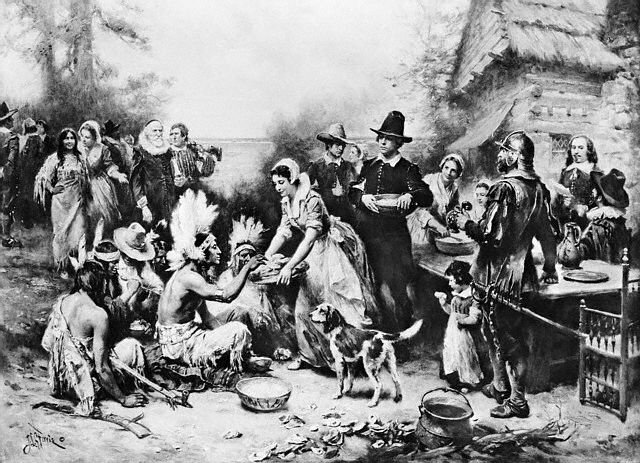 The first Thanksgiving was celebrated in 1621 at the behest of Governor William Bradford, and the Native Americans were invited guests of honor. Thanksgiving became an official holiday in the United States on October 3, 1863, via proclamation issued by President Abraham Lincoln. This was largely due to the lobbying efforts of Sarah Josepha Hale, editor of Godey’s Lady’s Magazine who had lobbied for 17 years for the holiday. The proclamation declared the last Thursday in November as Thanksgiving Day. By 1916, Thanksgiving was referred to in writings as Turkey Day due to the popularity of the bird at the traditional feast. Interestingly enough, in 1941, President Franklin D. Roosevelt attempted to move the official Thanksgiving date to earlier in November in order encourage a longer Christmas shopping season as a Depression recovery strategy. His idea was shut down by Congress, and the official date was declared permanently as the fourth Thursday in November via Public Law #379. The popularity of wild turkeys nearly wiped them out. The federal government stepped in with protection in 1991, and they are now found in 49 states. Turkey was most-associated with Thanksgiving and Christmas, making winter the prime season for turkey farmers. In 1935, the per capita consumption of turkey was only 1.7 pounds. Today, turkey has been recognized as a lean substitute for red meat. Aggressive marketing by turkey farmers by advertising and availability of parts rather than the necessity of cooking a whole bird has increased consumption to 20 pounds per person per year, with 74% of the consumption being in sliced turkey sandwiches.